For macOS 10.10 and higher, check out TimeTable 3! Why not use iCal for more than just scheduling? You already plan your life with iCal. 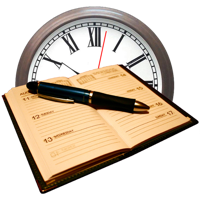 TimeTable is the easy way to get that information out of your calendar so you can use it with other applications. TimeTable makes it simple to track and bill for your time without keeping a second record outside of your calendar. You can find trends in your calendars by searching the details of your events and viewing the average, maximum and minimum times you have spent. TimeTable can export this data to email, text or comma separated values to use the results in other tools like email, invoicing, time tracking or spreadsheet applications. Events are edited and stored in iCal. TimeTable reads the events directly from the calendars in real time based on the timeframe selected. Since TimeTable only reads iCal data, there is nothing to save or backup. This makes it perfect for tracking and billing without keeping a second record outside of iCal.